With the election now behind us and major indexes hitting new all-time highs will the market charge higher or start to falter? As I was sitting down to write this commentary, Bill Cosby’s Street Football story kept coming to mind (Listen to it Here). In keeping with the Cosby theme, the question for investors is, should we act like Arnie taking 10 steps and cut left behind the black Chevy, Philbert waiting in the living room, or maybe, just maybe go long like the fat kid hoping to catch the pass over the water tower? In Cosby’s story Arnie and Philbert were not likely to catch the pass hiding either behind the car or in the living room. These would be scared or defensive investors in the market today. The other option is to be the fat kid and go long. Obviously, this kid didn’t get the ball very often, but in today’s market it just may be his day to catch the touchdown. Obviously, past performance is no guarantee of future results, but history is a good guide to help us navigate seasonal trends. 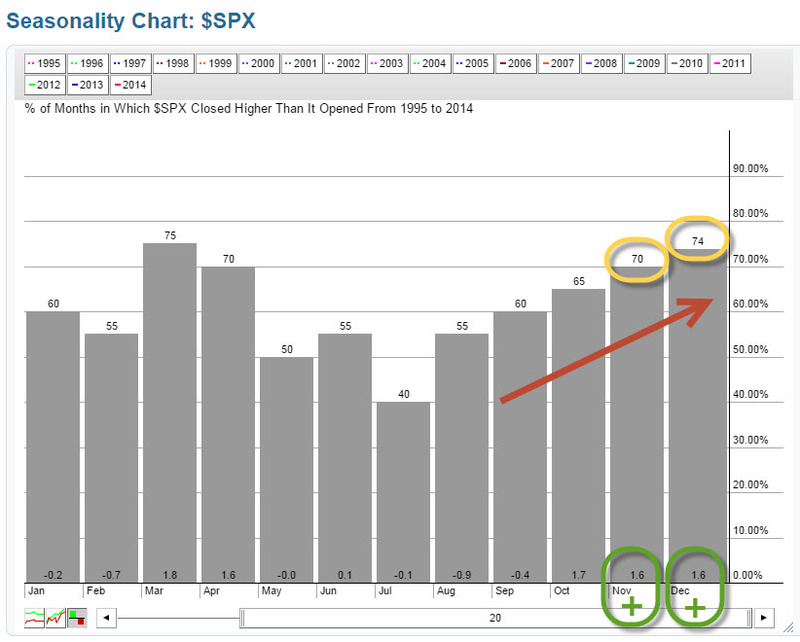 This chart illustrates the trend that for the past 19 years November and December have had a positive return bias. The data shows us that 70% of the time November is positive (marked in yellow), and its average return is 1.6% for the month (marked in green). December has an even higher slant towards being positive. It registers a positive return 74% of the time but with the same 1.6% average return. The take away from this chart is that history suggests we are in a favorable part of the year to invest. As a result of this chart pattern and our fundamental research, it suggests investors should be looking for opportunities in this market. In Bill Cosby’s story, going long wasn’t necessarily the best route to run, but in regards to investing in the stock market, history suggest going long is the right play to make. Hopefully, you found this chart informative and Bill Cosby’s story a bit humorous. It’s important to remember as investors we want to play on the side that is winning. Right now the data says the market is in a favorable period. As a result, our bias should focus on the potential for opportunities ahead until proven otherwise. As always, if and when the facts change – so shall we.